The spring and summer months allow a wealth of fresh canning possibilities. 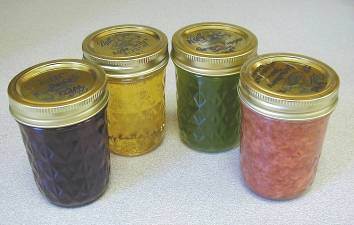 Tomatoes, corn and green beans from gardens can keep you canning or freezing until you wear out. But by winter, you may be ready to try some different types of preserves. Perhaps you’re also looking for ways to sweeten the upcoming Valentine’s Day holiday with home-preserved gifts for your loved ones. This recipe calls for frozen concentrated juice and powdered pectin and creates a delightful, flavorful orange jelly for toast or biscuits on dreary winter mornings or late afternoons. Begin by sterilizing your canning jars. To sterilize jars, boil empty, washed and rinsed jars for 10 minutes in water. The easiest way to do this is to stand empty jars upright on a rack in a boiling water canner filled with clean water. Keep jars hot until they are filled. Measure sugar and set aside. Mix juice and water in a saucepan and stir in powdered pectin. Bring to a full boil over high heat, stirring constantly. Once boiling, stir in all sugar. Stir and bring to a full boil that cannot be stirred down. Boil hard for one minute, stirring constantly. Remove from heat; skim off foam quickly. Pour hot jelly immediately into hot, sterile jars, leaving ¼-inch headspace. Wipe rims of jars with a dampened clean paper towel; adjust two-piece metal canning lids. Process in a boiling water canner for 5 minutes (10 minutes if 1,000-6,000 ft. altitude; 15 minutes if over 6,000 ft.). Allow jelly to cool, undisturbed, for 12 to 24 hours and check seals. You can remove screw bands after the food has cooled if the lids are sealed. This entry is an edited version of an article originally written by April Reese Sorrow and Elizabeth L. Andress. This entry was posted in Canning, Jams and Jellies, Recipes, Seasonal Food Tips and tagged canning in winter, frozen orange juice recipes, holiday gifts, Holidays, home preserved gifts, oranges, oranje juice recipes, seasonal recipes, Valentine's Day gifts on February 6, 2013 by nchfp.